Repurpose leftover roasted turkey from your Thanksgiving feast by putting an Italian spin on it. 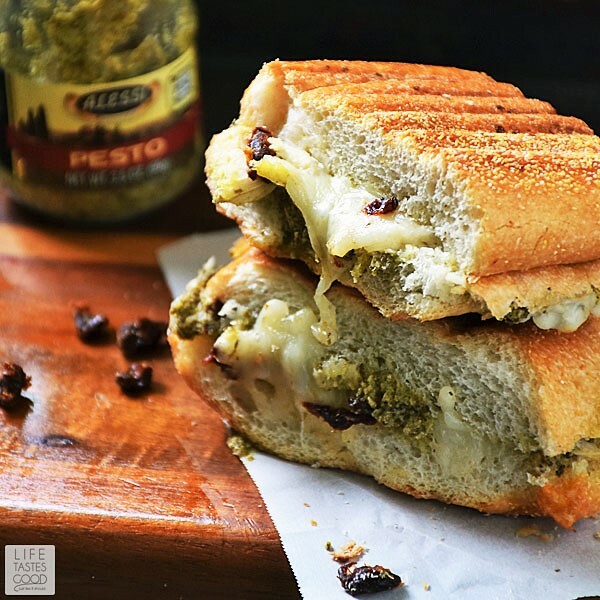 This Grilled Turkey Sandwich with pesto and sun dried tomatoes is a unique combination of flavors that work together to make one tasty grilled cheese sandwich. I partnered with Alessi to develop this Grilled Turkey Sandwich recipe. I regularly use Alessi products, so I am happy to participate in this project and share my love for these amazing flavors with you. Be sure to check out my other recipes using Alessi products: Asian Pork Meatballs and Pan Fried Gnocchi. As always all opinions are my own. Am I the only one who plans to have leftover turkey before I even buy my turkey? I make sure I get a big enough turkey so we can enjoy turkey sandwiches all different ways for at least 3 days after Thanksgiving. One of our favorite turkey sandwiches is this Grilled Turkey Sandwich with an Italian twist. 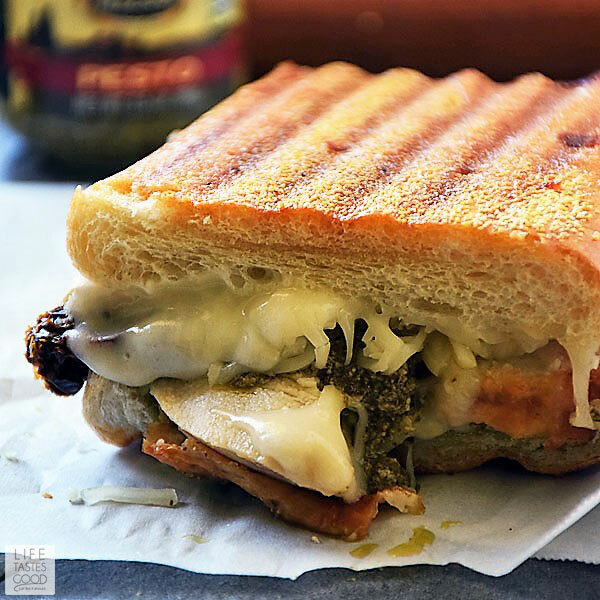 The roasted turkey combined with the zesty pesto and zing of sun dried tomatoes with creamy, cheesy mozzarella oozing out of the buttery, warm, toasted french bread makes my mouth water just thinking about all the tasty goodness. The first crunchy bite into this warm, grilled turkey sandwich is so satisfying you'll want to close your eyes and savor all the flavors. Plan for leftovers. Purchase a big enough turkey so you will have some leftover. This turkey calculator is super helpful in planning what size turkey to purchase. Be sure to mark the box that says 'we want leftovers'! Use a fresh loaf of bread so it's not too crunchy on the outside. I buy a loaf of french bread from my local grocery store's bakery. I give it a little squeeze to make sure it hasn't gotten too crunchy. 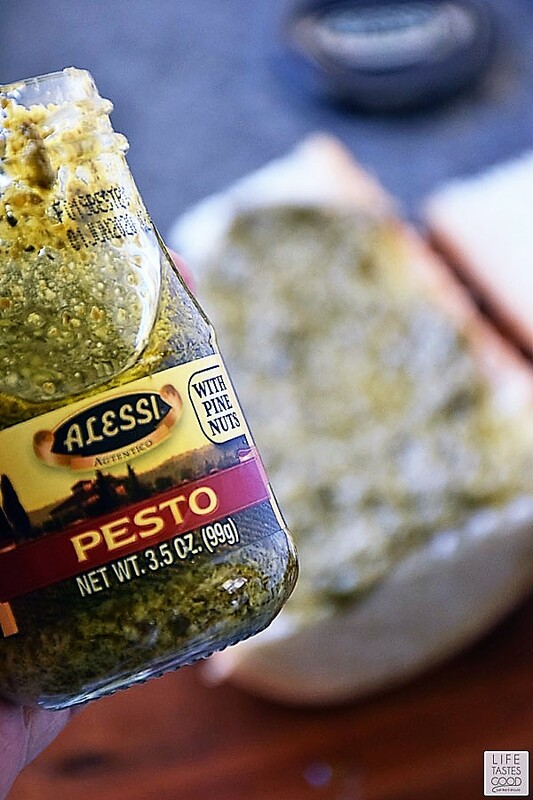 I love pesto and it used to be I would only eat homemade pesto because the ones I purchased at the store didn't taste like pesto until I found Alessi's pesto. Now I rarely make my own, because Alessi's pesto tastes so fresh and good. I always have some on hand. 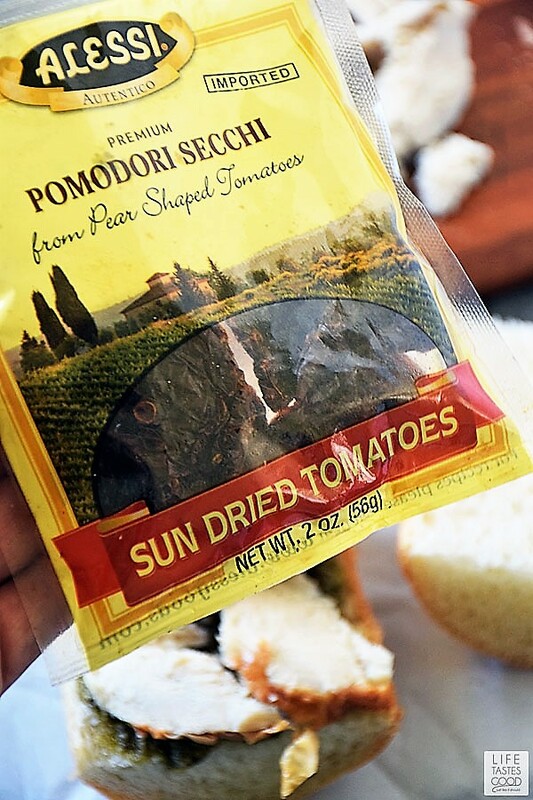 Dice the sun dried tomatoes into small pieces and only use about a teaspoon on the sandwich. Alessi's premium sun dried tomatoes are of a very high quality and highly concentrated so a little goes a long way. 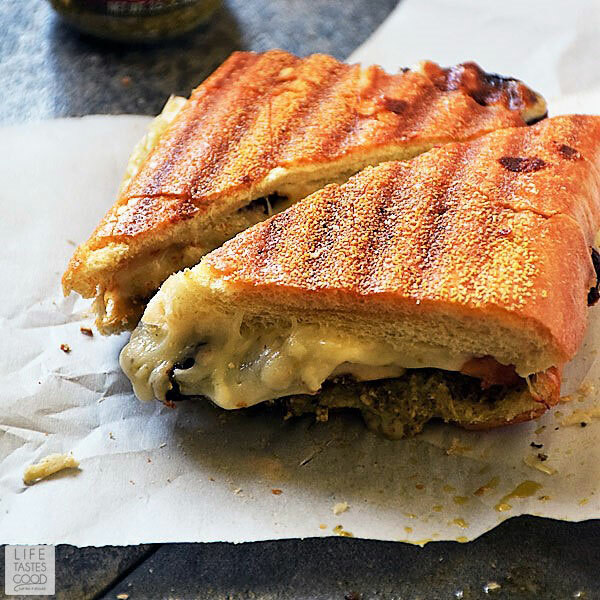 They pack a huge flavor punch and really add a nice zing to this sandwich, but you don't want to overdo it or they will overpower the other flavors. Allow the mozzarella to come to room temperature for best results. The cheese will melt better if you start with it at room temperature. There are several options for grilling this sandwich. 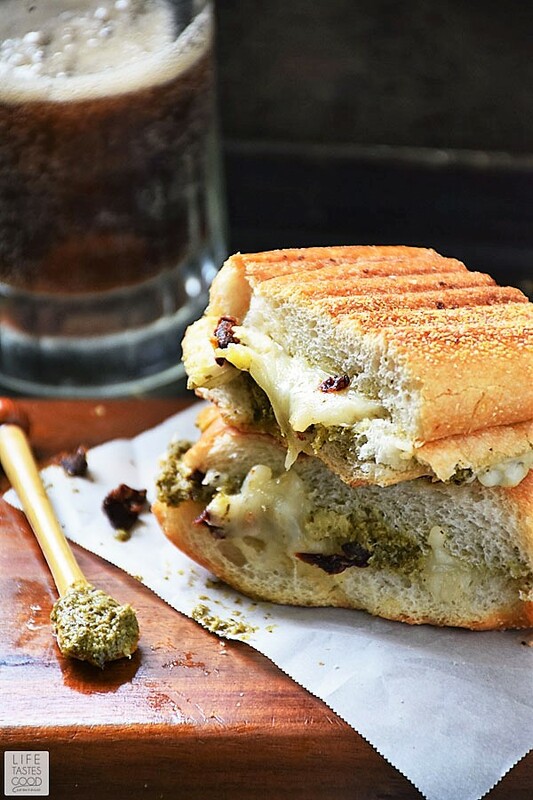 If you have a panini maker you can use that, but it's not necessary. You can grill it in a grill pan to get the grill marks or use a regular skillet to get the bread nice and toasty and melt the cheese. I use my George Foreman Grill. It was a gift years and years ago and it works great to make grilled sandwiches. It does a great job! The first crunchy bite into this warm, grilled turkey sandwich is so satisfying you'll want to close your eyes and savor all the flavors. Preheat the grill pan. Slice the french bread piece through the center so you have a top and a bottom to make the sandwich. Brush melted button on the outsides of both pieces of french bread. Working with the bottom piece of french bread, spread 1 tablespoon pesto on the non-buttered side of the bread (the inside of the bread) and top with 2-3 ounces of leftover roasted turkey. Sprinkle on 1 teaspoon diced sun dried tomatoes and 1/3 cup mozzarella cheese. Place the top half of the bread on top of the sandwich with the buttered side out. Carefully transfer sandwich to grill pan and grill until toasty on both sides. I used a George Foreman Grill so it grilled both sides at once, and I was able to press down gently on the sandwich. If you are using a grill pan, I suggest placing a heavy pan on top of the sandwich to press down gently while grilling each side. Serve and enjoy! I have truly loved surfing around your blog posts. After all I'll be subscribing in your feed and I'm hoping you write again very soon!